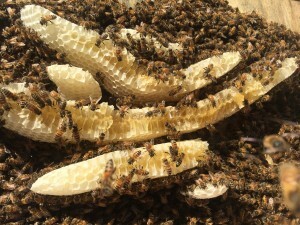 The ladies built some comb under the hive cover. They had lots of honey stored. Had to help myself to some. Yummy! Today was the warmest day of the year so far, and the bees were excited to be out. Saw lots of drones so they’re probably already out mating at drone bars! Really, it’s true. They go to “congregations” and their only task is to mate. Which by the way is a fatal act because their, um, male parts stay with the queen they mate until she finds the next drone who will remove it. And so on and so on, until she is all done and heads back to the hive with all the eggs she’ll need for the rest of her life. The drones are stuck between a rock and a hard place. If they don’t mate, eventually the worker bees back home will stop allowing them into the hive to be fed and cared for. Rough life, and these ladies don’t play. 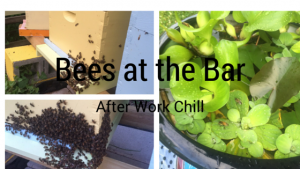 I was so busy beekeeping at the end of the summer last year, I didn’t have the bandwidth to focus on blogging. So, I have lots to share. At the height of the summer I had five hives! That’s after starting with just two nucs. By the start of the fall, one hive swarmed, and I lost a queen in another so I had to combine those two hives to end up with four. And they all survived the winter! As a matter of fact, the winter was so mild, one very industrious colony started making honey in late February. Check it out! 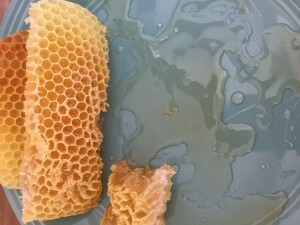 They built that comb on the inside of the cover of the hive and started making honey from some very early blooming. I learned how to make be fondant and fed them through the winter once they ran out of honey stores. Spent a lot of anxious time in the cold with my ears pressed to the hive to make sure they were buzzing away in there, all clustered up. A few days ago, I saw the bees clustered around the hive entrances after a hot day and got really nervous that they were getting ready to swarm. Until then, the bees would head inside once the sun started going down. On this particular night by 8:30pm they were still in a bunch outside, and the numbers were growing. I thought for sure they’d be gone by morning having swarmed in a tree out of my reach. It didn’t happen. The next day they huddled again, and then they did the same thing again on another warm day. Turns out, this is how they cool off. They were also hanging out by the container pond I set up for them as a water source. Lesson: bees have chill. Guess what? I did another split! Up to six colonies now. One of the hives was getting crowded, and I didn’t have a spare box. Rather than risk a swarm, I picked two frames with full of covered brood and newly laid cells, and put them in a nuc box. That induced the making of a queen. It’s been a week and you’ll see in the pic that they’re raising a queen! 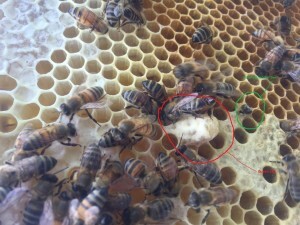 The red circle is the supersedure cell (queen in the making), the green circle is a hatching worker bee. In a little over a week, if all goes well, there’ll be a new queen hatching. Cross your fingers. Maybe you’ve considered getting a couple of hives, or maybe you’re just intrigued by the curious life of an apiary. Here’s a video of my backyard so that you can see one example of the kind of space necessary to keep bees. 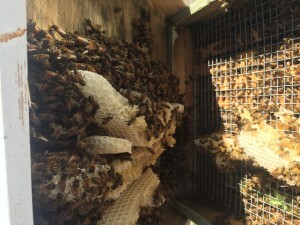 I live in the suburbs, and things are going fine so far with beekeeping in the backyard – all two months! I checked in with my next door neighbors before I started. Chatted with them a little bit about what to expect and why, and they were fine. You can keep bees in more densely populated urban neighborhoods too. There is a growing number of rooftop beekeepers, and right on the concrete slab behind a townhouse you can place a hive stand and get started, if you are so inclined. Be sure to check your HOA bylaws, and city code. Many municipalities are recognizing the importance of pollinators like bees, and doing what they can to support, or at least allow, beekeeping. There is also the option of partnering with someone who has space and wouldn’t mind hosting. There’s plenty of that going on too. I’m no videographer, but I hope this gives you a sense of what it’s like in my bee yard. A year ago I met a woman while waiting for the laction room at work. She was a mid-career detailee from the Department of Defense, and in our brief conversation she changed the passage of time for me. It’s a gift I hope I can share. We were both moms of infants in the hustle and bustle of juggling busy careers and families. Naturally, we talked about sleep deprivation, the various developmental mile stones of our little ones, and the relevant anxieties. She shared that she was a single parent and this would likely be her only child because age and fertility issues probably meant she couldn’t have another. Her baby boy had some digestive issues so she was having to nurse him more than she’d expected at a year old resulting in frequent interruptions during the work day to accommodate pumping. Nights were long and the days were squeezed, her family lived far away, unable to help much, but with all of that she was still serene. Delighted. Savoring every bit of it. I thought I understood her zen. I had made a conscious decision years ago to try limit or eliminate my griping about the duties of parenting. Yes, it was stressful sometimes, but I had in my four children all that I had hoped for and more. I leaned on my mantra, don’t complain about your blessings. What this woman was saying to me was similar, but it was better. I still found myself wanting to rush through unpleasant moments, days, development phases. It was a kind of complaint. I can’t wait until she grows out of this whining. How much longer before the school performance ends? When will you get to the point where you don’t wet the entire bathroom floor when you take a bath? This stranger helped me to see all those moments differently. I told her that I couldn’t wait until my baby could sleep for a seven hour stretch. She told me that she used to say all the time that she couldn’t wait for this or that thing to happen, but her son helped her to realize that her language reinforced the act of rushing through life. She got rid of “I can’t wait” so that she could be still and take it all in. When tempted to wish away a moment she chose instead to “look forward to” where it would lead. Simple isn’t it? I haven’t been the same since that revelation. It didn’t happen instantly, but the difference was profound. In moments of exasperation, her words came to mind like an unexpected summer breeze. I stood still. In coming months when we celebrated family birthdays it didn’t feel so much like the time crept up on me. I could laugh a little when the girls made a habit out of sneaking off with a bowl of popcorn so they could dump it on the floor and eat it like pecking chickens. The clean up didn’t feel so arduous. Frequent trips to the musty middle school lost-and-found to dig for my sons missing sweatshirts were fodder for teasing instead fuel for my fury. When my hubby was traveling for work, I could be less bitter about having more on my plate because I was looking forward to how nice it would be when he was back home. Just that little tweak to my thinking about time and place, and I was a little less burdened. For that I am eternally grateful to the stranger in the nurse’s office. I look forward to seeing her again.